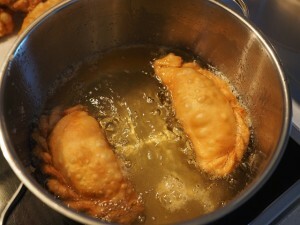 Have you wondered about deep frying in a pressure cook? Do you want to do it but don’t know how or if it’s safe? Pressure frying is nothing more than a variation of pressure cooking. It’s useful to understand why pressure is used in cooking. The entire process of pressure cooking involves cooking food in some type of liquid within a sealed vessel. Most people prefer to just use a pressure cooker because it’s a product made specifically for this type of cooking. The reason why many people prefer pressure cooking is because it’s capable of cooking food much faster than the conventional cooking techniques; it also saves energy. The initial pressure that is used in the process is generated from boiling a liquid. Some people prefer to use broth for the liquid while others use regular water. The steam that gets trapped inside of the pressure cooker greatly increases the internal temperature and pressure. When the food is finished cooking, pressure is gradually released from the cooker, which makes it safe to open. A lot of chefs use this cooking technique as a way to simulate the effects of simmering or braising. Virtually any type of food that can be cooked in water-based liquids can be cooked inside of a pressure cooker. The sad reality is that you absolutely cannot use this type of product for deep frying. The owner’s manual that you received with the purchase of your pressure cooker probably warns specifically against such an idea. These products are NOT meant to be used with a large amount of oil. In most cases, the maximum amount of oil that you can use with a product that cooks under pressure is 1/4th of a cup. For many people, the thought of boiling oil at 400 degrees is quite scary, but boiling oil at this temperature under pressure could be disastrous. There IS a product that you can use to fry your favorite foods under pressure – it’s called a pressure fryer. You should also never use a pressure fry pan for deep frying food. It’s true that you could TRY to ignore this advice, but you’re basically turning your pressure cooker into a giant oil bomb, which could even cause death. The only alternative is to purchase a pressure fryer, which is a product that is specifically made for deep frying foods in a high-pressure environment. Even then, you need to read the instructions very carefully before you use it. Put simply, it is frying food under pressure. Not the type of pressure that you would feel before trying to impress a prospective employer. We’re talking about pressure generated from the boiling of liquid. The greatest benefit of this technique is the fact that it speeds up the frying process while saving your oil. 9 times out of 10, it’s used for frying chicken. The well-known brand, KFC, has been using this method for their chicken for a LONG time. While under pressure, far less steam is generated, which ensures more moisture stays in the chicken. Another benefit is less greasy food. The pressure prevents the moisture from escaping the food while preventing oil from replacing the place of the moisture. By pressure frying, you can cook chicken in as little as 15 minutes. The internal temperature of the chicken can reach 250 degrees F, whereas regular frying only allows for an internal food temperature of 215 F. The reason why you should never use a regular pressure cooker for deep frying is because the product’s seals aren’t meant to withstand the extremely high temperature of the oil. Unfortunately, a large portion of pressure fryers are very large and primarily meant for commercial use, such as inside of a restaurant. There are some companies that make smaller models that are meant for home use, so you can look into those. It’s almost always best to use vegetable oils for pressure frying.